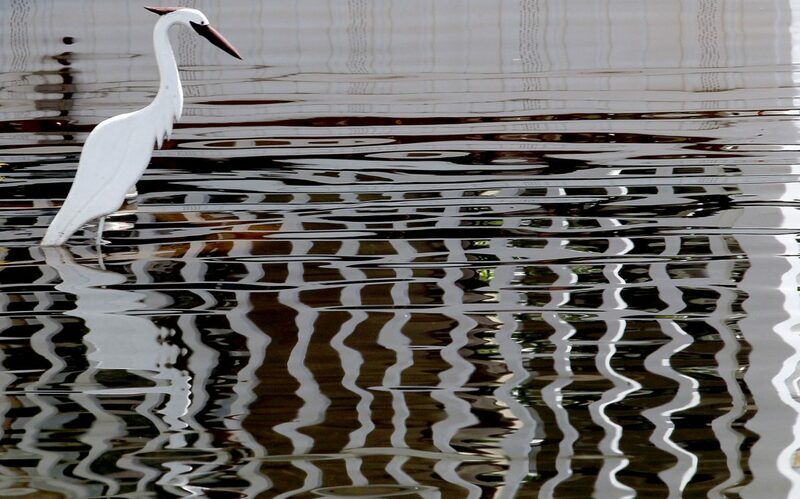 A wooded statue Egret is reflected on the water that surrounds the park at the Sand Piper Resort on Saturday, Sept.15, 2018, in Edinburg. EDINBURG — Residents at the Sandpiper RV Park are finally getting some relief after Hidalgo County Precinct 4 stepped in to pump more than a foot of standing water out of the north Edinburg community. Dozens of mobile homes were underwater for more than a week after last week’s rainfall, which fell the hardest in the ranchlands north of Edinburg. The park, located in a low lying area, was one of the hardest hit by direct and indirect rain. Water from the ranchlands flowed south into a nearby field and spilled into the gated nudist community, frustrating residents who were just recovering from flooding in June. A swale located on the north side of the park was overloaded with water and did little to stop the flow from the north side. “You know how they say, the s— stops here? Well, guess where it stopped,” park owner Karen Willis said. Portions of the park remained underwater Wednesday as Precinct 4 crews worked to pump the water, which was black in color, out. “It’ll be at least three days to get the road dry,” Willis said. Residents were left without water and restroom capabilities as the water began to rise last week, causing septic tanks to leak. The contaminated water posed a health hazard, which allowed the county to enter private property to pump the water out. Hidalgo County Drainage District Manager Raul Sesin said the district is working to address the issue through two projects: The Faysville Drain and the Raymondville Drain. The Faysville Drain will replace the swell and carry water to North Main Drain No. 3, while the Raymondville Drain, a massive regional project, will carry water to the Laguna Madre. The district will ask voters to approve a $190 million bond in November, which will raise the tax rate by 3 cents, Sesin said. If approved, about $6.9 million will go toward the construction of the Faysville Drain. The district is currently in the process of acquiring the land. “There was no way we could do this without their help,” Willis said.